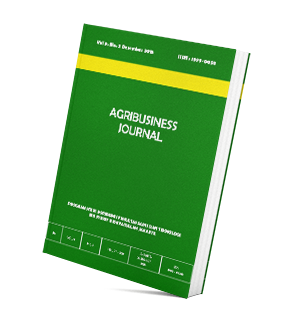 Agribusiness Journal is a biannual and peer review journal published since June 1, 2007 by Study Program of Agribusiness, Faculty of Science and Technology, UIN Syarif Hidayatullah Jakarta. Previously it has the name of Jurnal Agribisnis. Since 2017, it has been published with the name of Agribusiness Journal according to the registration name from LIPI (ISSN 1979-0058). The journal is in Bahasa publishing 2 issues per year on June and December. The journal covers all aspects of agribusiness and rural development, including agricultural economics and natural resource, business and entrepreneurship, agricultural management, agricultural marketing, consumer behavior, farmer’s community empowerment, agricultural communication, agricultural institution and human resource, economics of halal food, agricultural finance, agricultural policy, international trade, agro-technology, and food security.